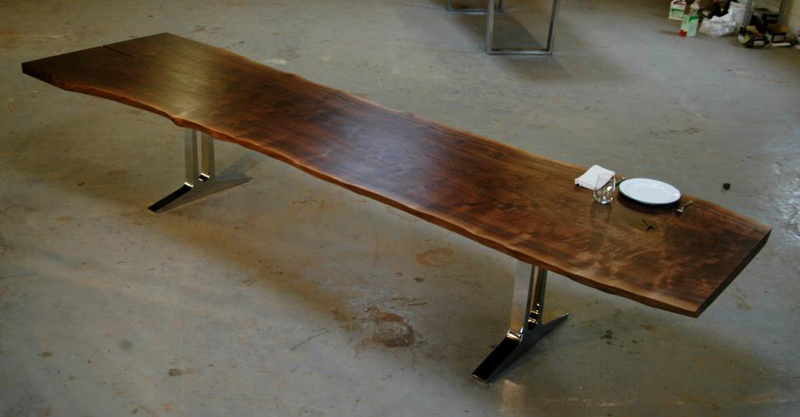 This reclaimed wood bench is made from an 18ft long slab of claro walnut. 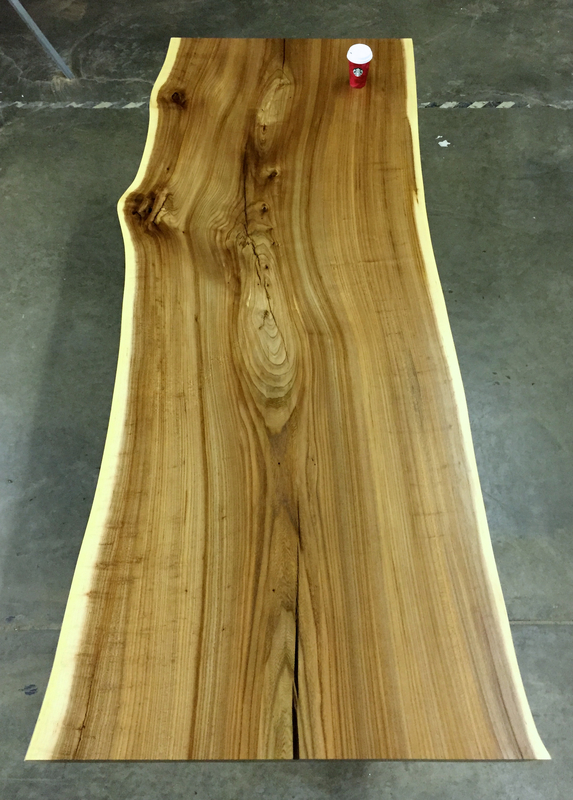 As far as live edge wood bencheds go, this one might be on the extreme end at 18ft, but the client that ordered it clearly had a very large and specific spot for it in their house. 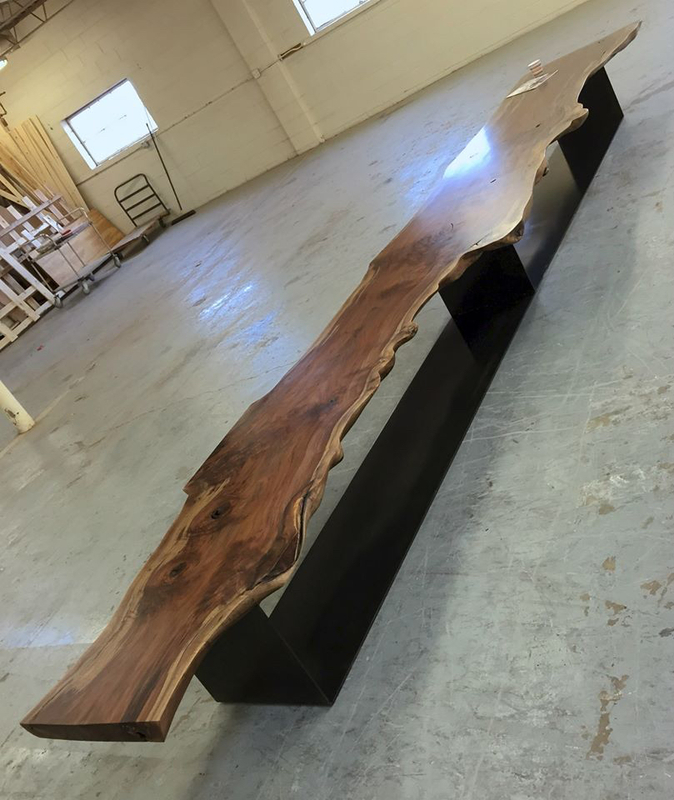 So we use it as a great example of no matter how large scale you want to go with your custom furniture designs, there is a high likelyhood that we can fill it. 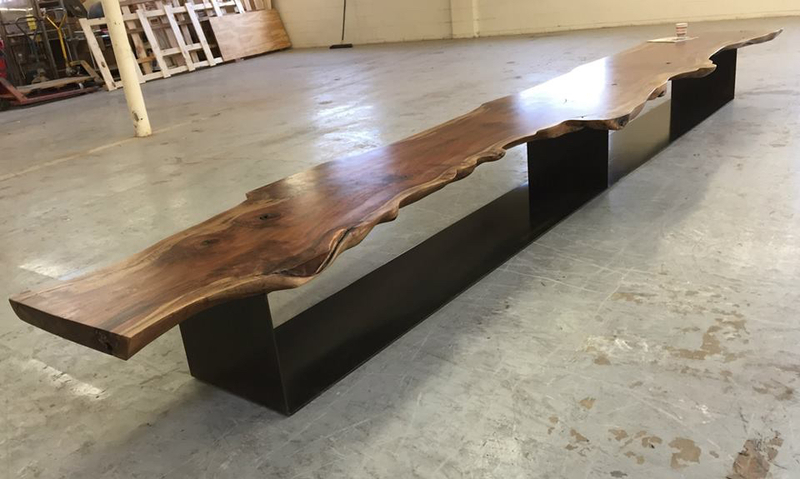 The live edge makes what would otherwise just be a long straight edge bench a lot more interesting, breaking up the 18ft with interesting curves and indentations. 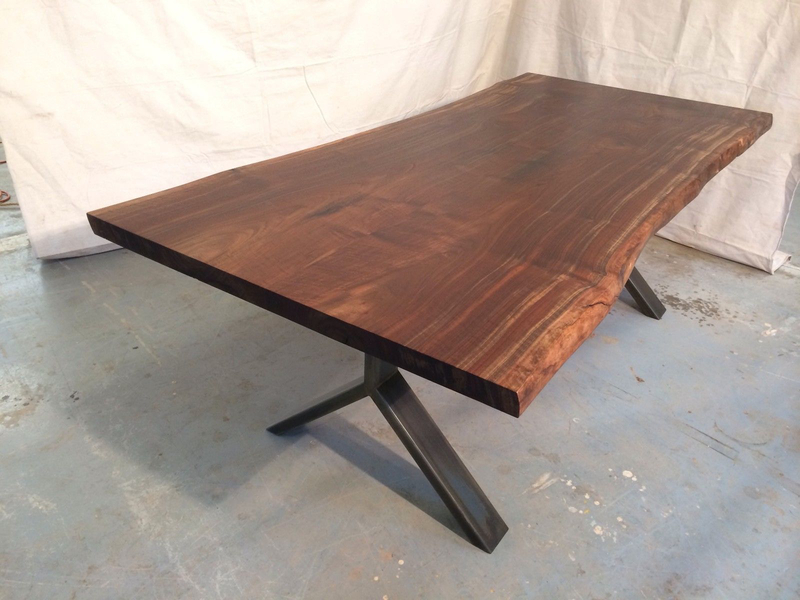 To us, this bookmatched black walnut slab dining table gets the best of both worlds. 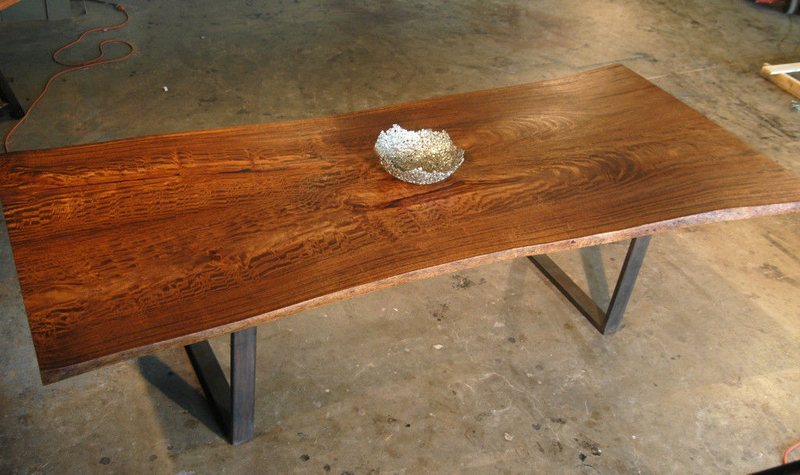 The straight outer edge gives it a nice clean look that is only emphasized by the raw center edge to the table. 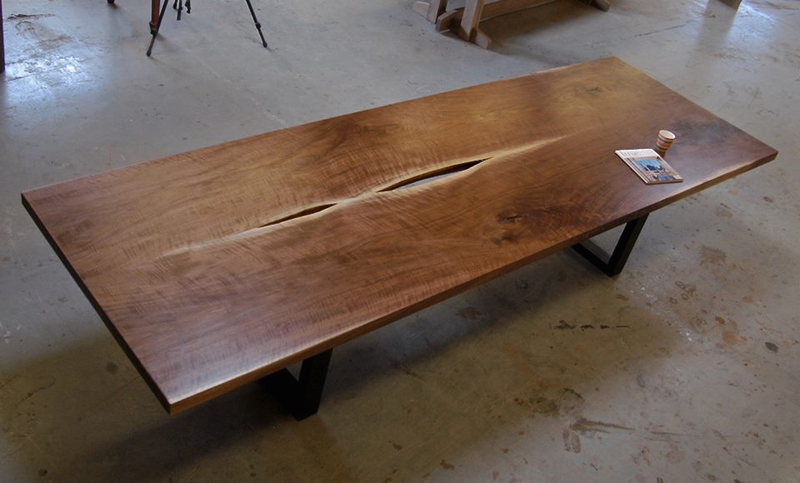 The feather graining runs all the way through the slabs making it one of the best grained dining table tops we have made for someone. 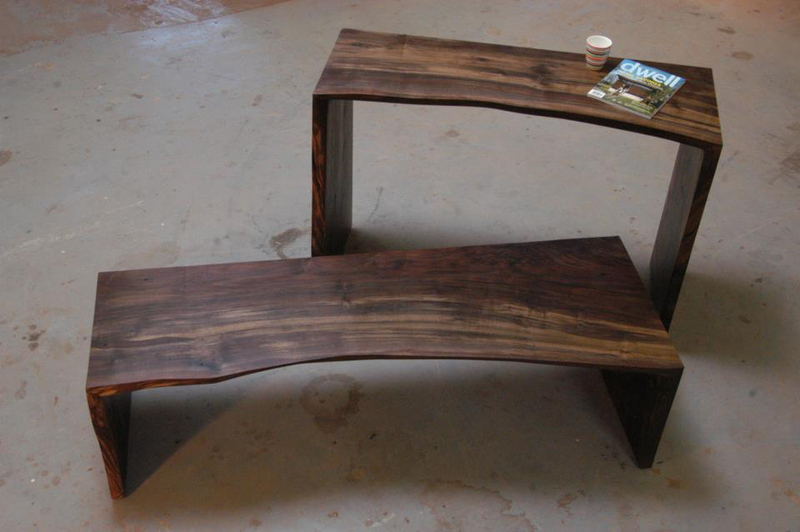 Sitting on our square tube legs it has a great balance between modern and organic. 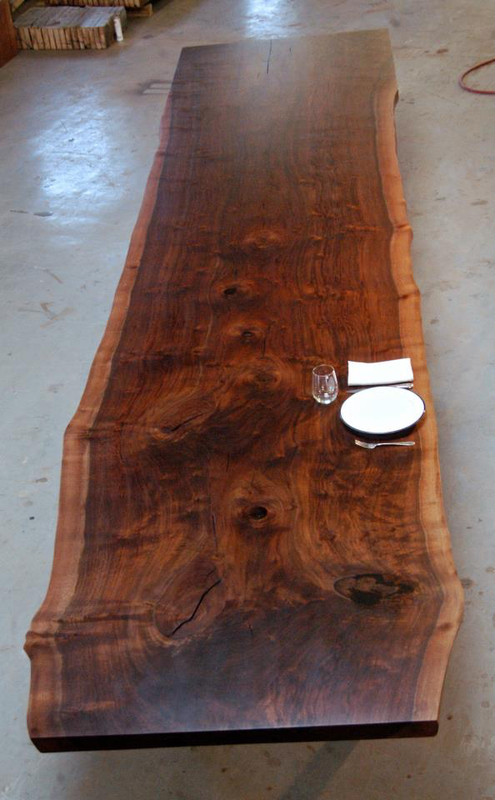 This is a really large slab of elm which makes for one of the nicer light wood dining tables we have made. 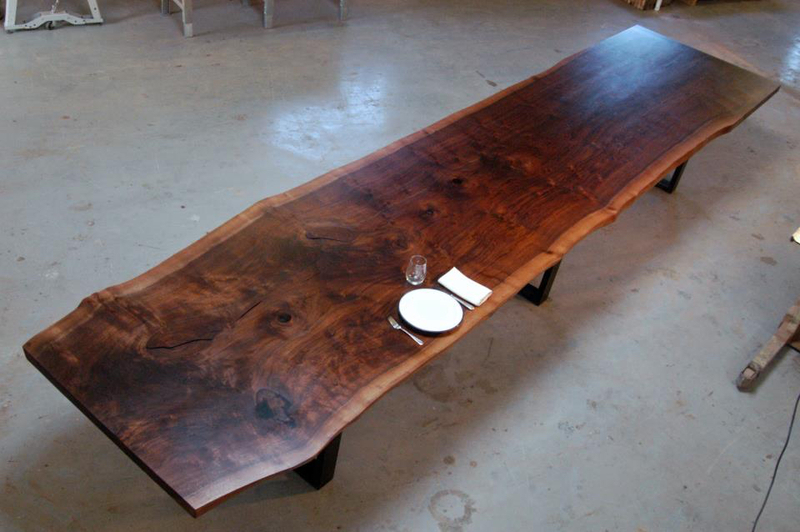 It's hard to find single slabs of lighter woods this large to make a decent sized dining table - this one was around 9ft x 4ft. 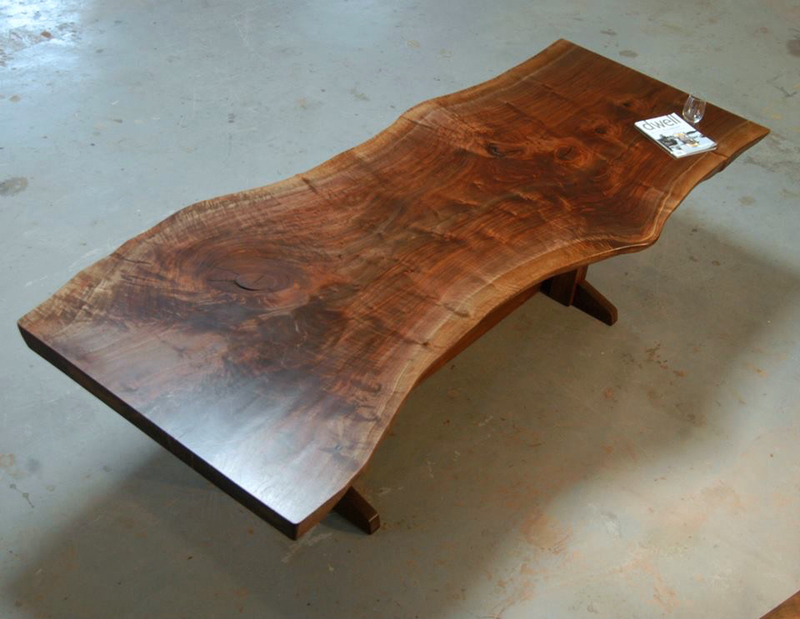 To us, elm is the light wood version of walnut with long flowing grain and a distinct sapwood. 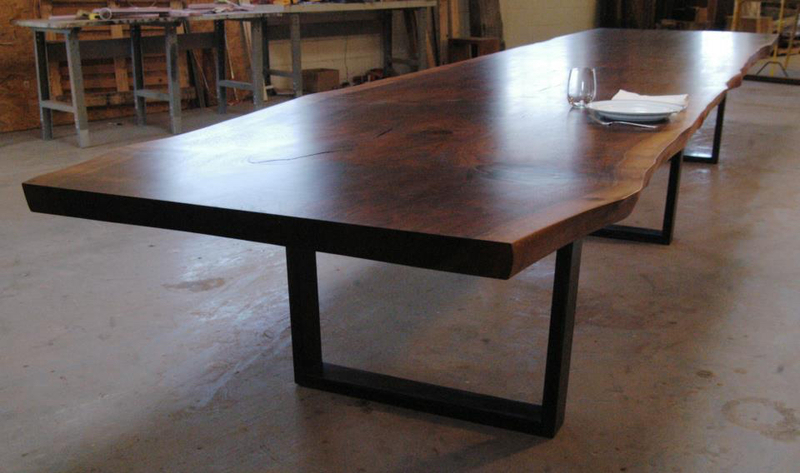 So if you are looking for a light wood dining table, elm is a great place to start. 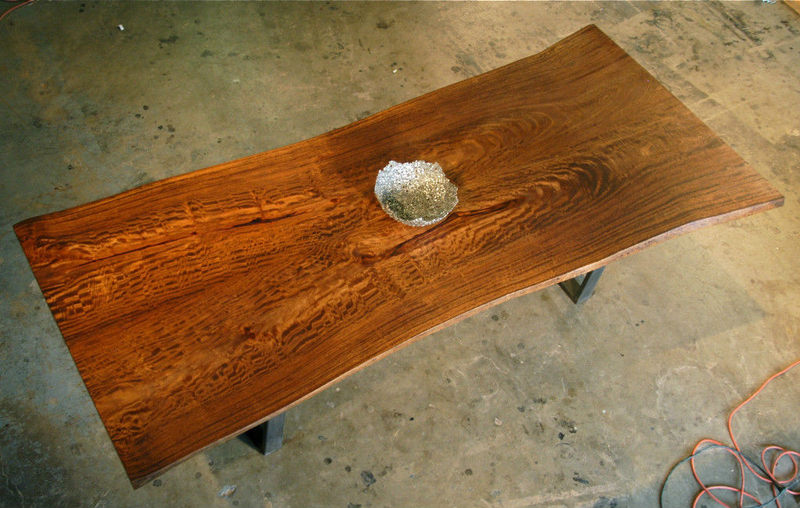 This was a set of waterfall grain tables we made for a client - a console and a coffee table. 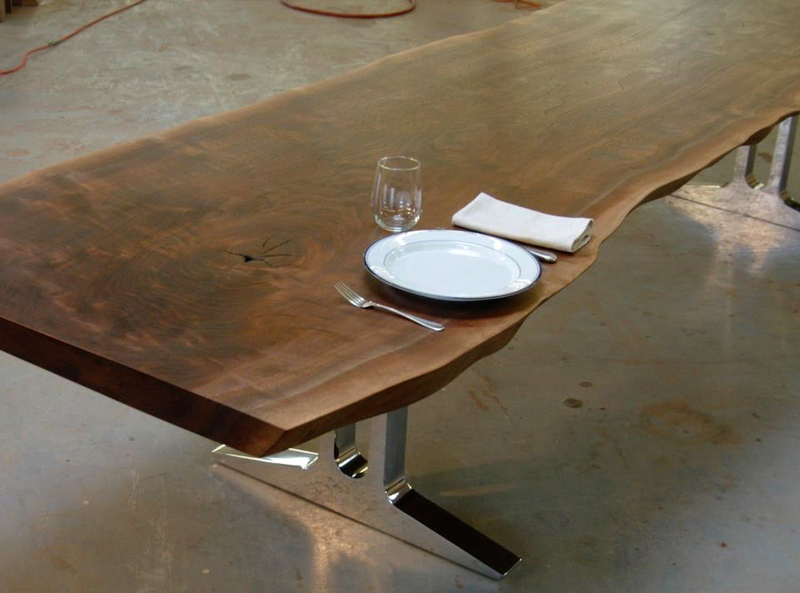 They are each made out of single slabs of claro walnut, so the grain is continuous along the whole piece. 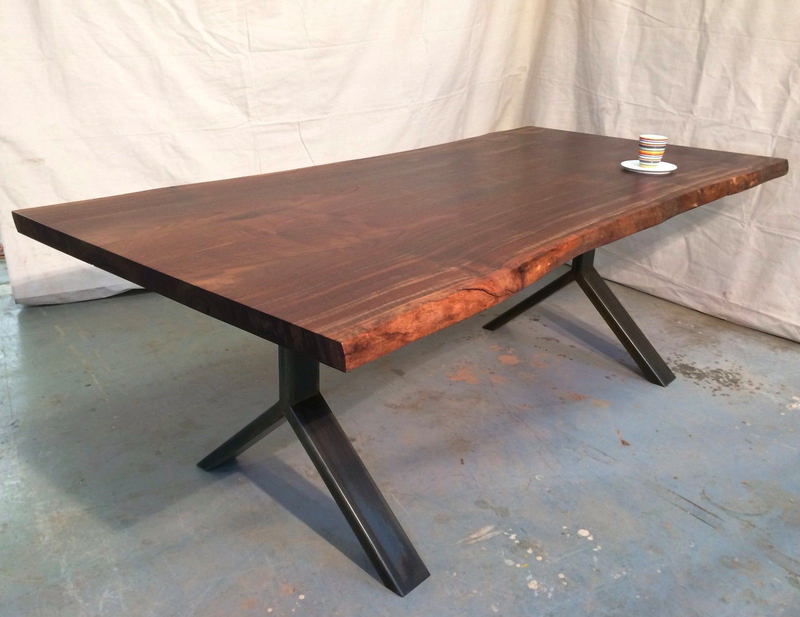 A raw front edge and a straight back edge make these claro walnut tables really easy to push up against a wall as an accent piece, or to have in front of a sofa with the raw edge facing out and the straight edge facing in. 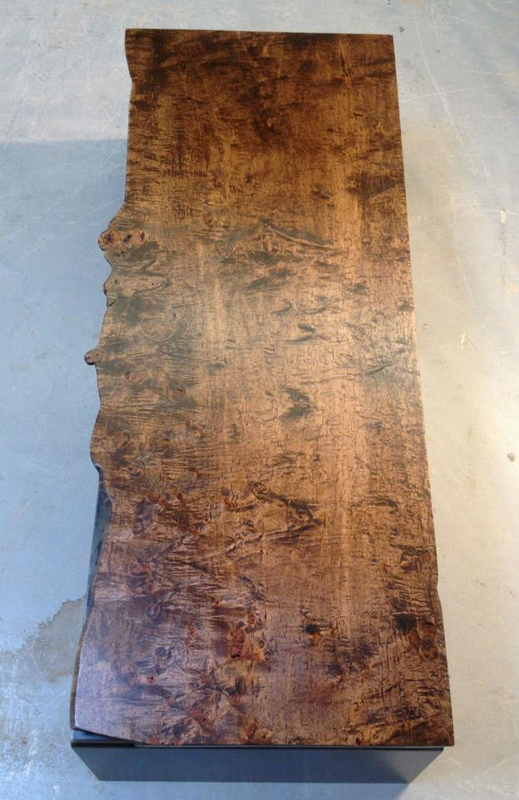 This is actually a slab of maple (a very light wood) that we stained dark. 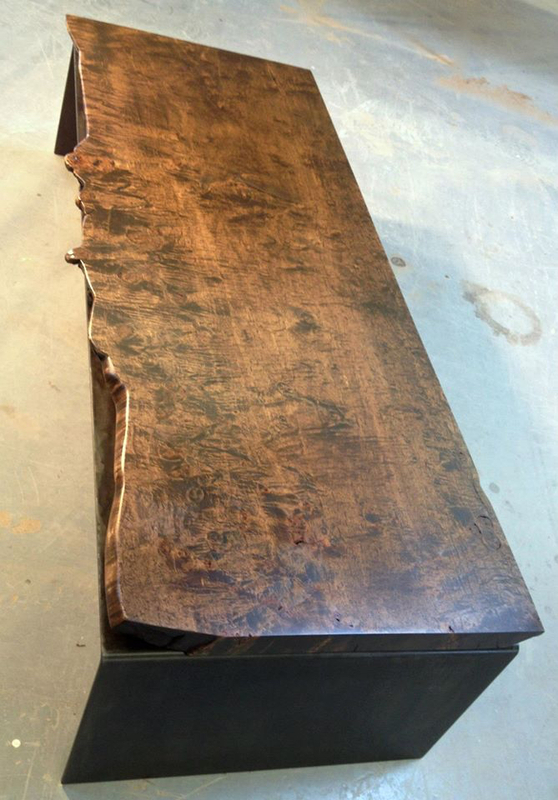 It has some great burling and figuring throughout the slab, a live front edge and a straight back edge. 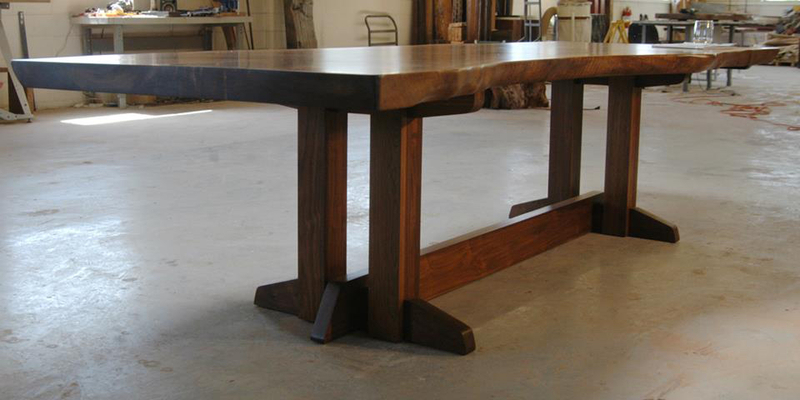 It floats 1/2" above the steel base with the attachments hidden well inside so you don't see them. 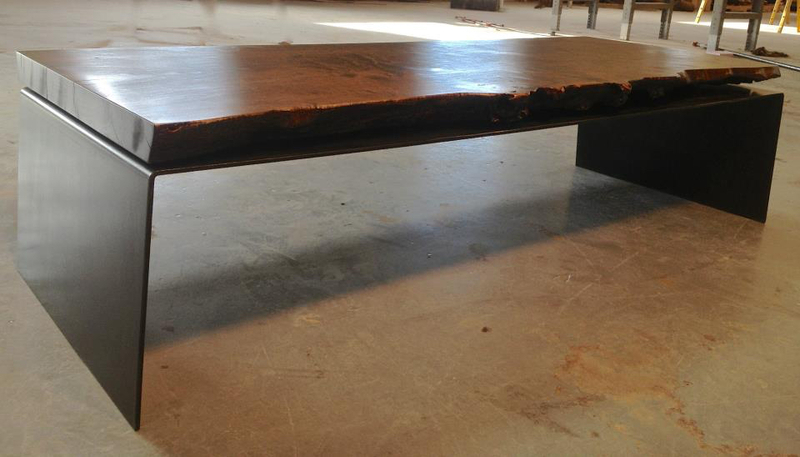 As for the base, it is made of a single slab of bent 1/4" steel. 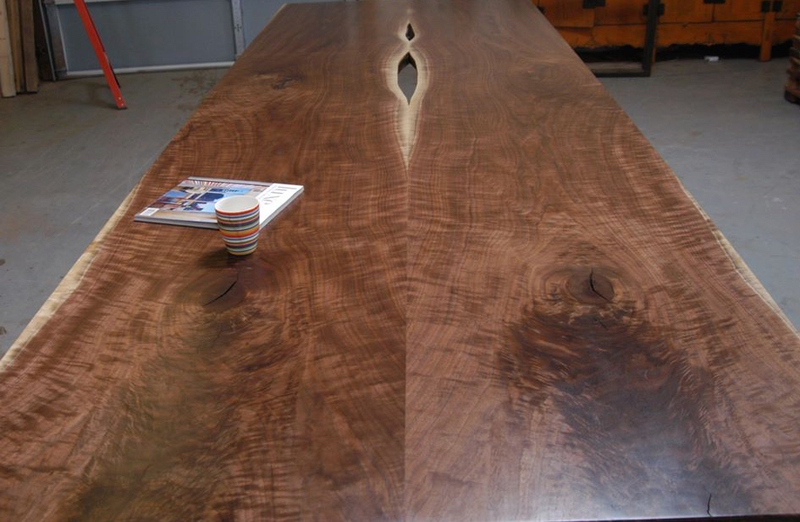 This bookmatched claro walnut kitchen table has all that claro walnut salbs are known for: great variation in grain color from lights to darks, a relatively consistent live edge and a really smooth finish. 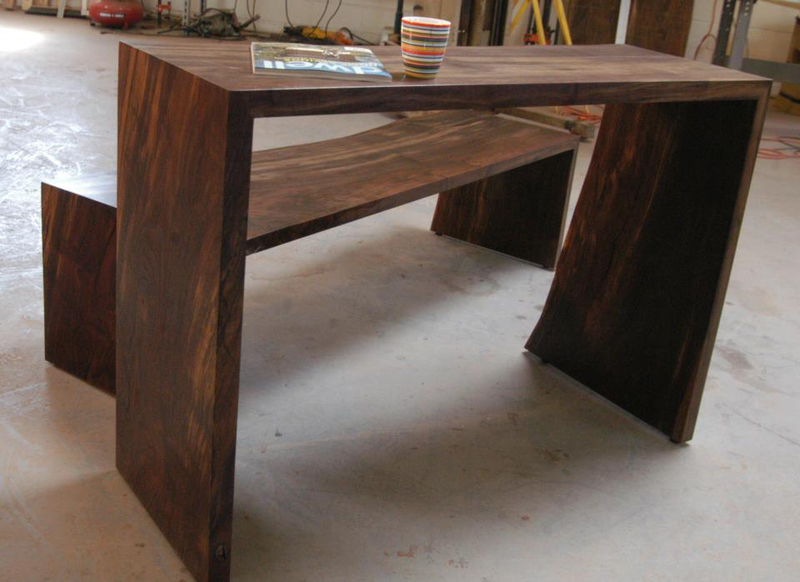 It makes for a wonderful kitchen table, and the Y legs made out of rectangular tubing are some of the best legs for tight seating areas because your knees don't run into them. 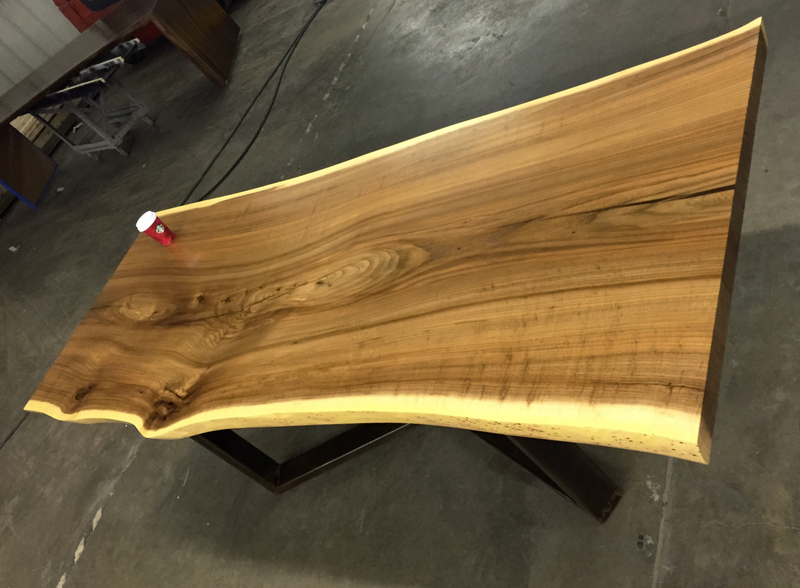 We have talked about mango wood in several places on this web site. 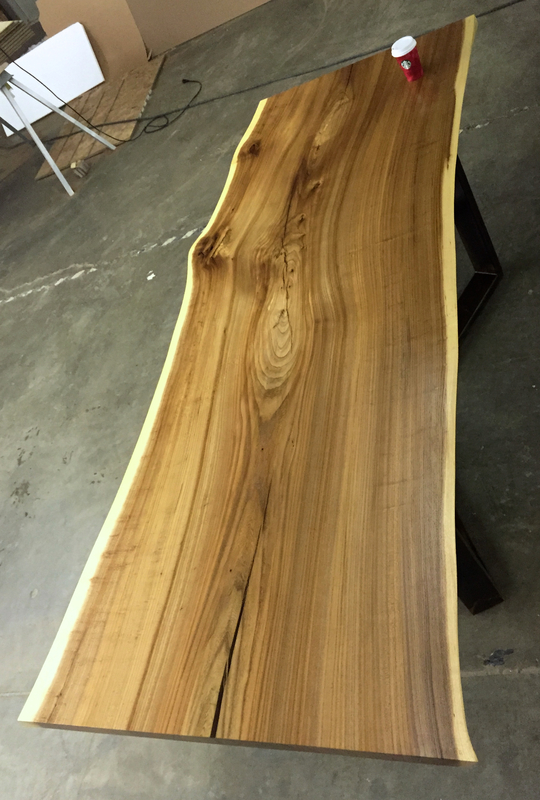 It is one of our most favorite woods because of mango wood's variety of grain, color, ease to work woth and it ability to finish like a piece of glass. 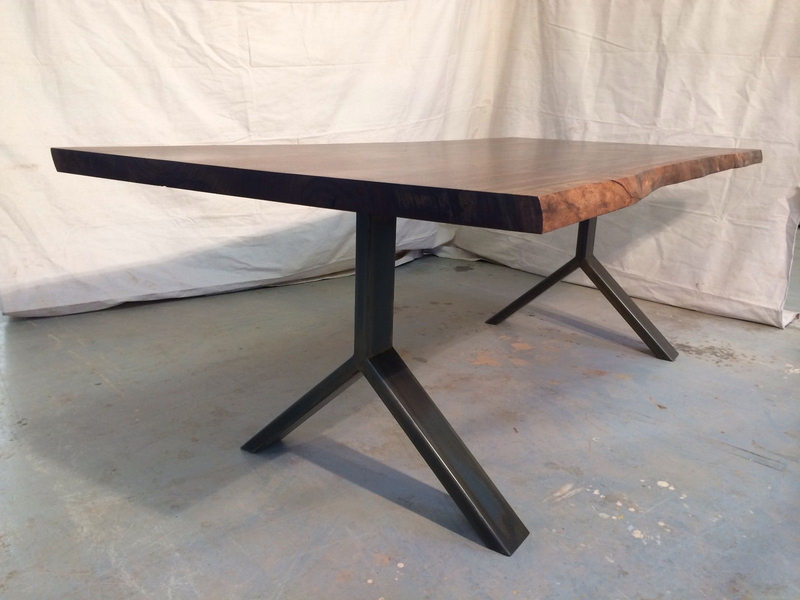 This was a 10ft x 4ft dining table we made for a client, and we put a very light stain on it to darken the wood just a little while still not taking away from the light wood dining table feel (if such a thing exists). 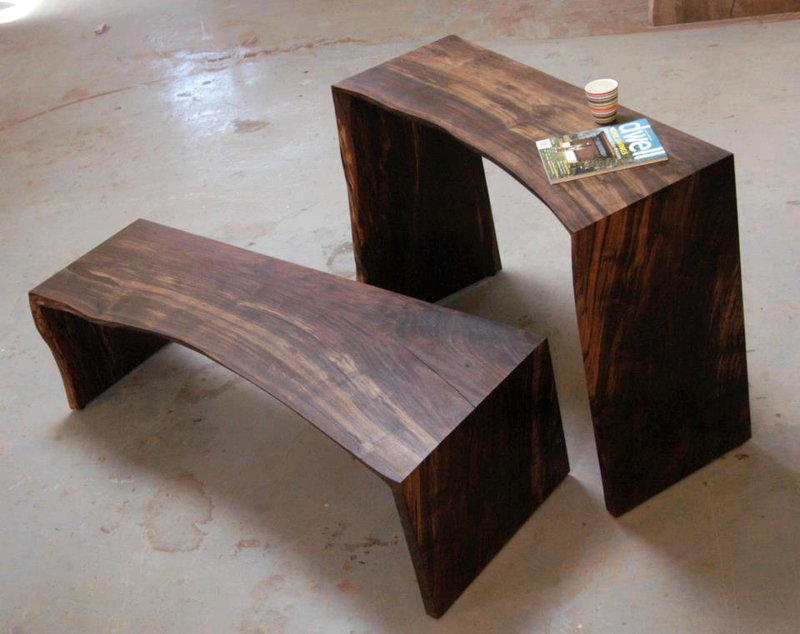 Sitting on our best selling U legs, the top really shows itself off. 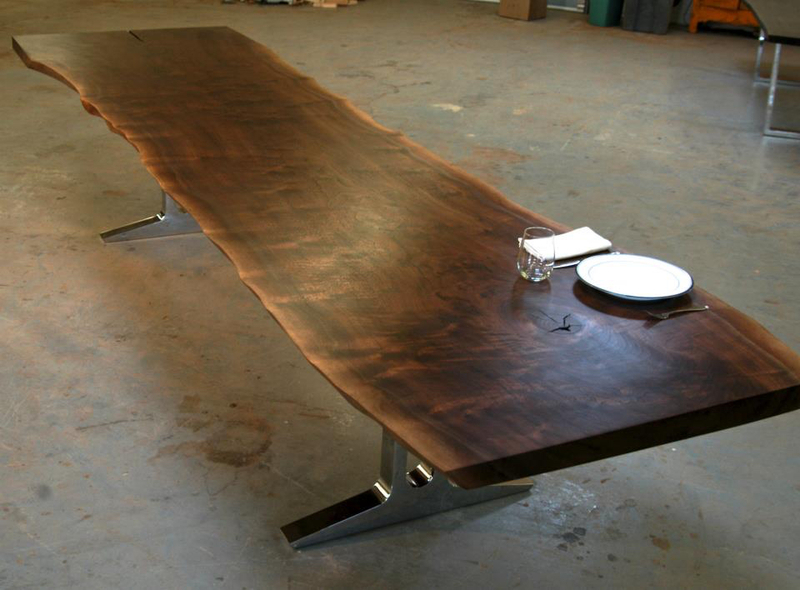 This was an 16ft long single slab of black walnut dining table with a raw edge. 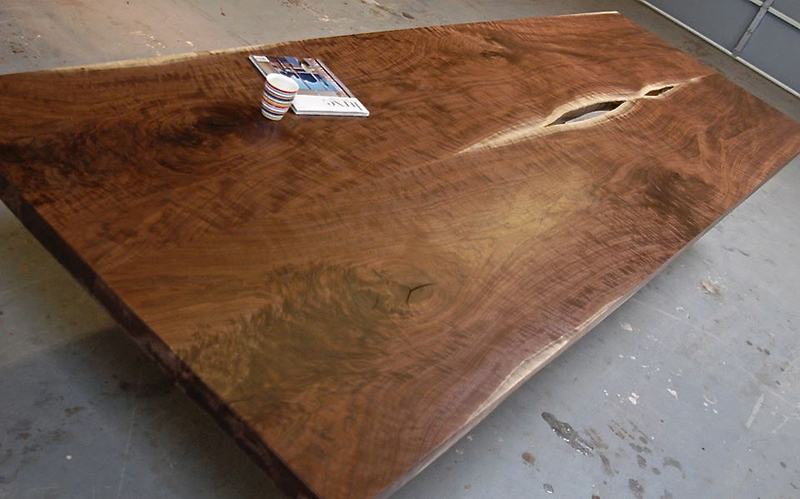 The slab was a salvaged walnut slab from Oregon, and we were able to keep both edges entirely live. 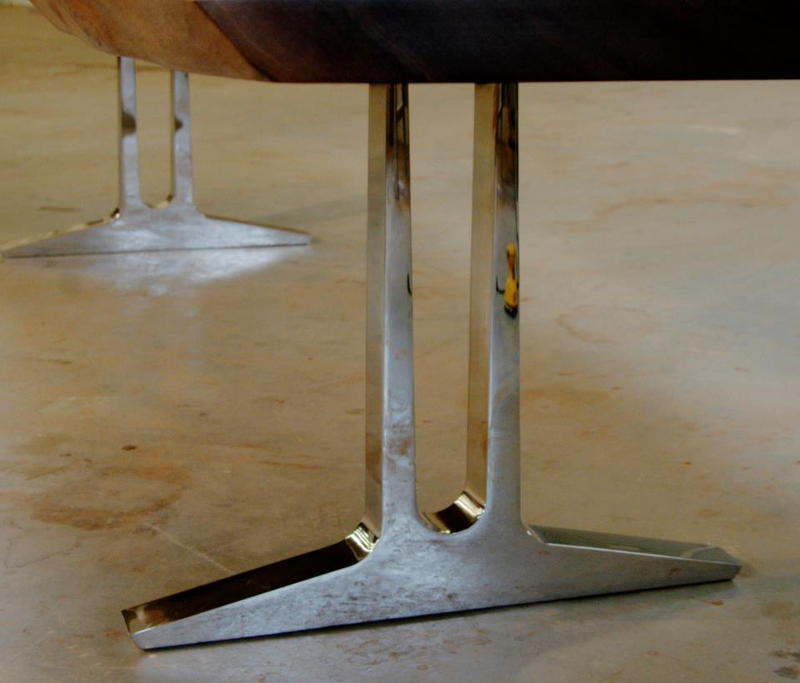 The other big deal with this table is the legs. 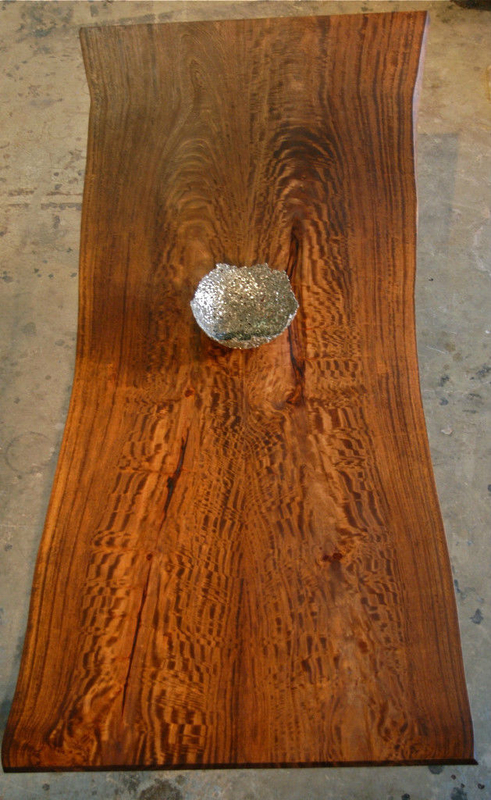 They are cut on a water jet, 3" thick to support this giant sized slab, polished to a mirror finish and then chromed. 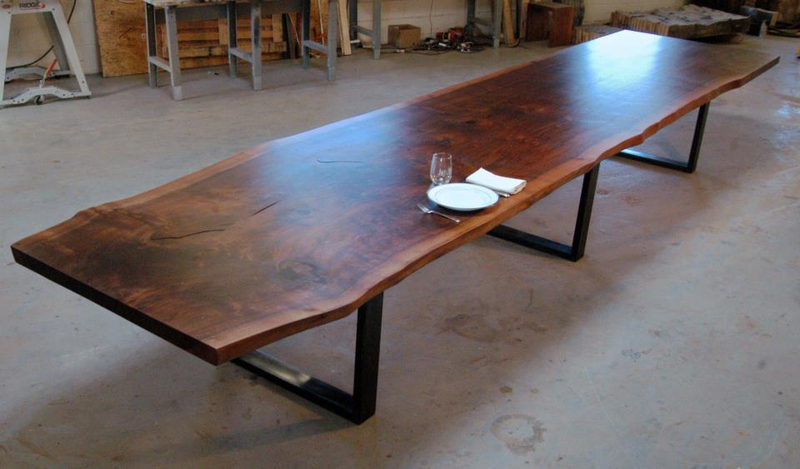 Certainly not our least expensive leg (or table in general) but it really was amazing. 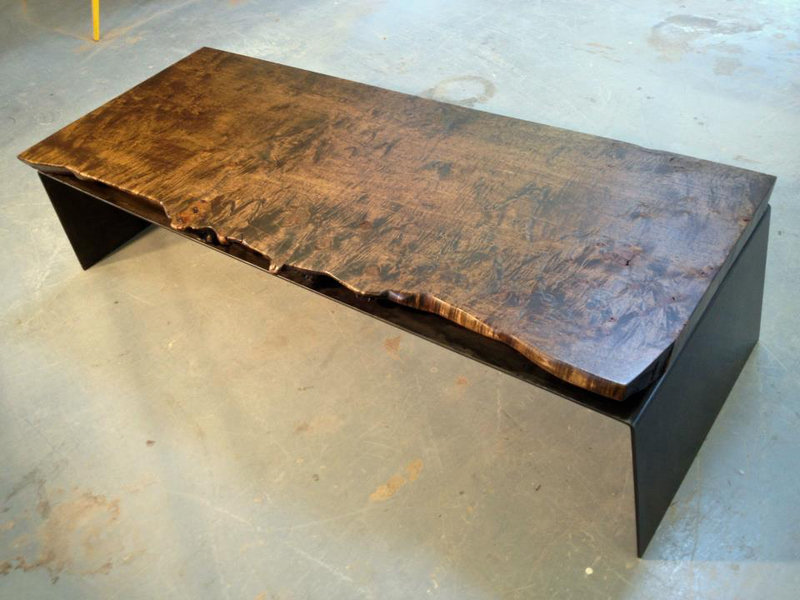 The modern legs with the organic feel of the raw edge dining slab is a great juxtaposition. 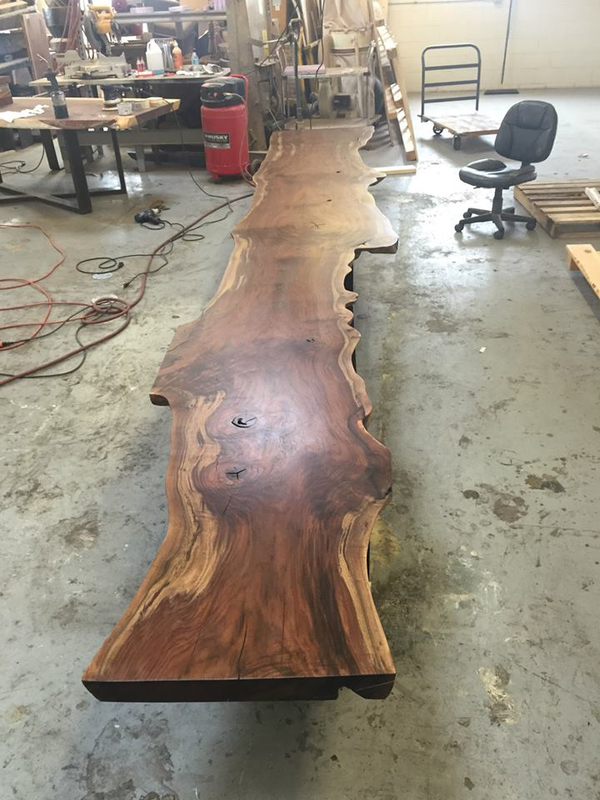 This was one of our biggest tables we have made. 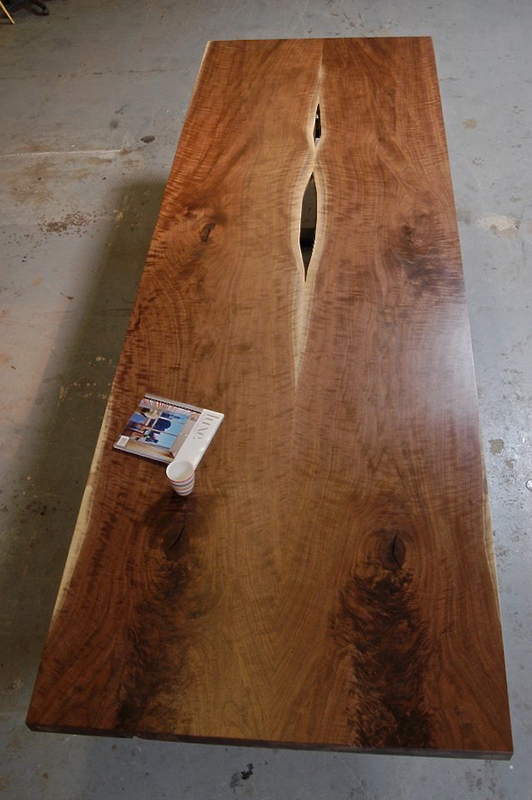 It's a giant slab of black walnut: 18ftx4ft and 3" thick after milling it down from 4". 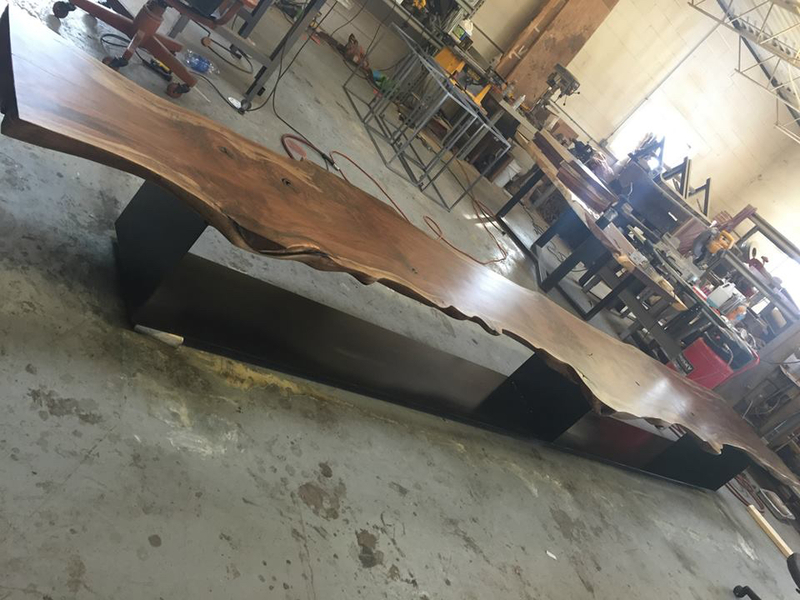 So large, we needed three legs to make it structurally sound - not because the slab would bend in the middle without a third leg (it wouldn't), but because the slab is so heavy, it would collapse the two legs at the ends. 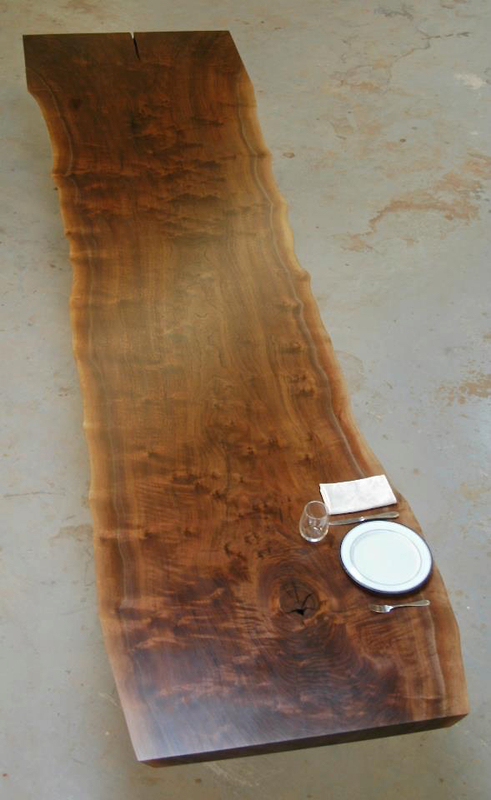 Simply cutting a giant walnut dining table slab like that out of a log takes a day of cutting (depending on how sharp your bldes are). Kiln drying it takes another 3-4 months. 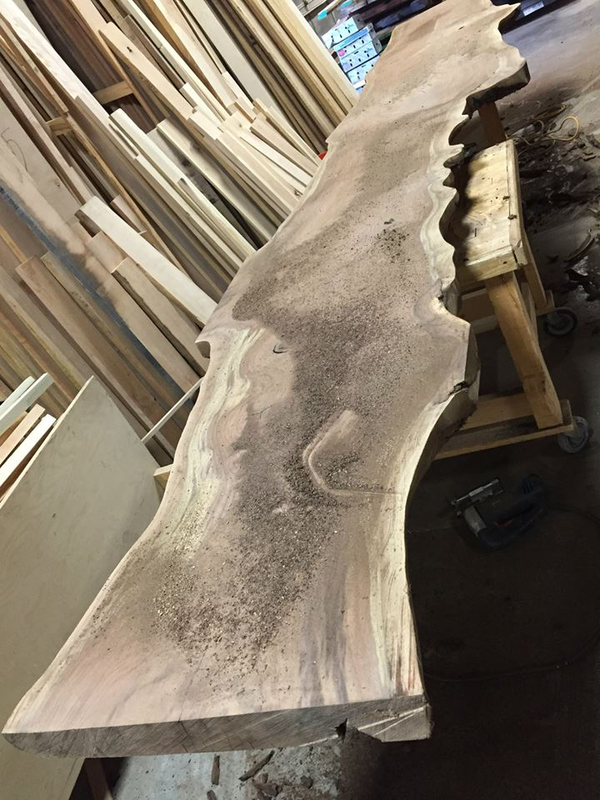 Then we get to start cutting and sanding. 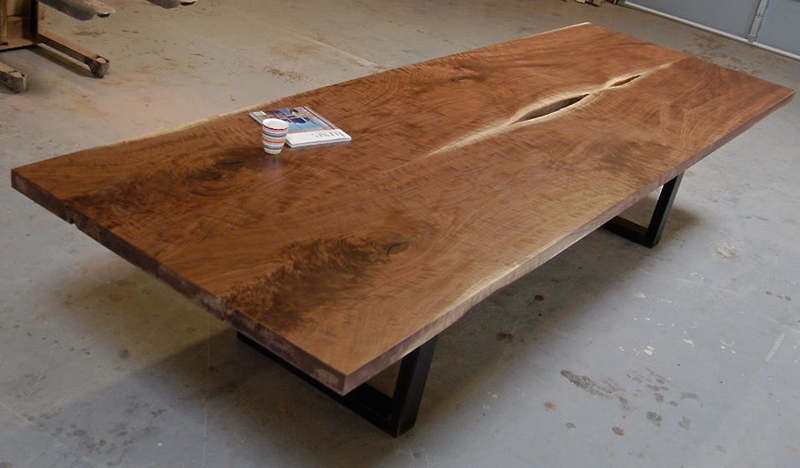 This is a a great live edge claro walnut dining table top with a traditional trestle base, also out of wlanut. 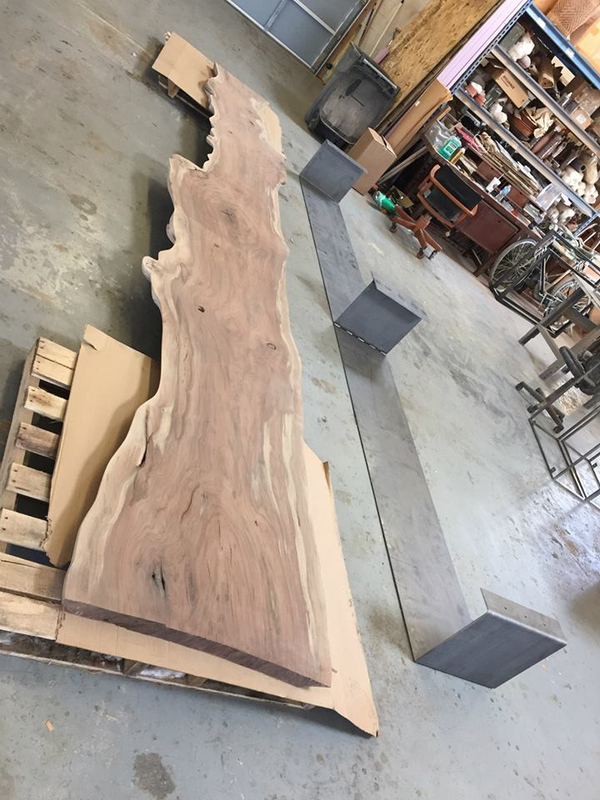 There was beautiful graining throughout the slab, and we sent this client around 6-10 slabs for them to pick from - they chose wisely. 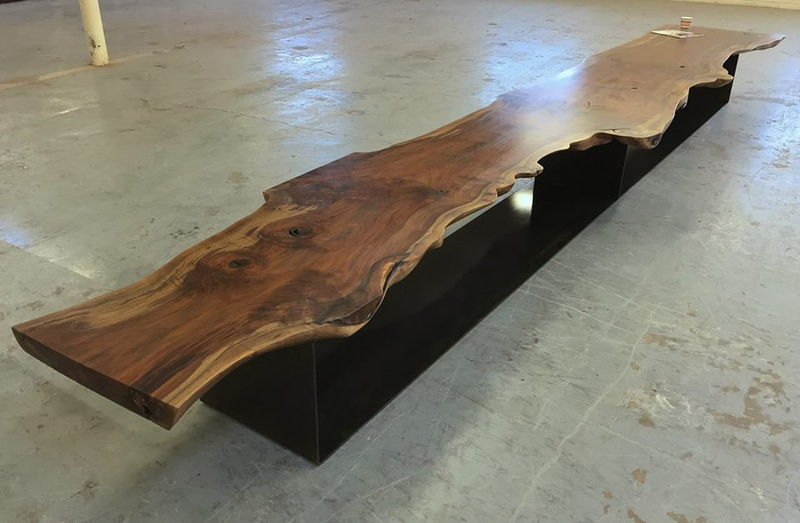 The live edge has some great movement to it without going too overboard, and the walnut trestle base is solid feeling without being overly chunky. 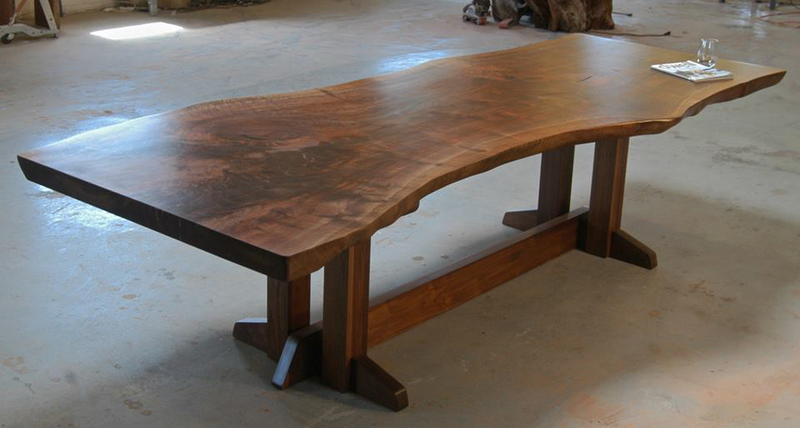 The base also has some great joinery that any woodworker would really appreciate.